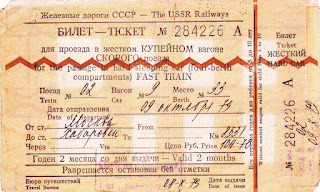 I traveled across the southern part of Siberia on the trans-Siberian train in October 1979 during Soviet times — from Yaroslavski station in Moscow to Khabarovsk, where all foreigners had to get off to spend a night, and then from Khabarovsk to Nakhodka east of Vladivostok. I loved the Lake Baykal area most, where the train passes a stone’s throw from the lake shore near Slyudyanka, with the snow-capped Sayan Mountains on the Mongolian border to the south. Beautiful. (Scroll down to the bottom of this post under the links to “Photos:” for more on my impression of Soviet Russia during that 9-day journey across the vast land). The trans-Siberian was part of my first trip to Japan. It took me exactly two weeks to get from Luxembourg to Yokohama, from 6 to 20 October 1979 — 11 days on trains. I was ushered to Japan on the Soviet Morflot passenger ship Baikal by the remnant of Supertyphoon Tip, which a few days earlier had been the largest and most intense tropical cyclone ever measured (it’s described in Wikipedia and in a 1998 report I have from the US National Oceanic and Atmospheric Administration). We left Nakhodka about midday on 17 October 1979, crossed the Sea of Japan (or Eastern Sea), then passed through Tsugaru Strait between the Japanese islands of Honshu and Hokkaido before turning south off the Pacific side of Honshu, headed for Yokohama. The weather was really beautiful and the sea was calm until some time after we passed Hakodate on Hokkaido Island in the afternoon of 18 October, entering the Pacific Ocean. The sky darkened, the sea got rough — I got seasick fairly quickly — and soon all passengers were asked to go below deck because the ship’s crew was going to lock all hatches. No passenger was allowed on deck any more. The captain’s announcement did not say anything about us heading into a big storm but it was obvious from the rocking and creaking of the boat that something like that was afoot. Not long after that I spent about 24 hours passing back and forth between the bed in my cabin and the toilet across the corridor, my body seemingly turning inside out from extreme seasickness. Around midnight of the 19th the storm eased up, and the Baikal steamed at full speed towards Yokohama Bay, which we finally entered around 6 a.m. on the morning of the 20th. The Baikal’s nice sunroof aft on deck was almost completely chewed up, as if a giant had bitten off pieces of it. A Japanese coastguard or customs boat pulled up alongside and officers came on board the Baikal to check our passports. Nowadays I regret very much that it took me very long to realize it would be a good idea to buy a camera and take pictures during my travels. My father always had a camera and took a lot of photos, and he also shot quite a bit of film of our family with a small wind-up 8-mm Yashica camera that he bought at the Brussels World’s Fair in 1958. Despite this it didn’t occur to me that I should get a camera of my own to take along on my travels. I did buy a cheap Polaroid camera shortly after I arrived in New York City in March 1975 and took a few pictures in Central Park that I still have — nothing very interesting. In 1982, again in New York, I took a few more pictures in the Chinatown area with another Polaroid. I finally bought my first 35-mm camera in 1984 during a short trip to Luxembourg to renew my passport while I was living in Cyprus. It was a Yashica, fixed-focus — very simple and cheap. But I took a lot of good pictures with it in Cyprus, Pakistan, Afghanistan and Japan -- where I bought an Olympus OM-10 with a 35-70 lens at Camera-No-Doi in Tokyo in 1987. This Olympus served me well in Japan, Pakistan, Afghanistan, Greece, Egypt, Cyprus and Luxembourg, though I never learned how to use all its features. Since 2003 I have been using digital cameras, including a Fujifilm Finepix S2950 that I got for my 60th birthday in early 2011 — nothing fancy but I’m quite happy with it, though still shooting mostly on automatic…..
About my first trip to Japan, I was not pressed for time and thought it would be more interesting to go by train and boat (rather than flying). Also, I wanted to see with my own eyes what the Soviet Union looked like. At the time, in New York, I worked for a Moonie (=followers of the late Korean Christian sect leader Sun Myung Moon) anti-communist newspaper where all of us regarded the USSR as the big enemy, the ‘evil empire.’ I was on my way via Japan to Bangkok/Thailand, where I wanted to work as correspondent for that newspaper. At the time also, the leader of our religious movement Sun Myung Moon himself kept saying he wanted to go to Moscow to hold a ‘freedom rally’ in Red Square, and all of us Moonies were supposed to prepare for that (it meant the liberation of the USSR). I was quite skeptical of his chances of doing that but I wanted to get my own impression of the country first. On the train in West Germany headed for Moscow I met a man who was a Communist Party official from Tselinograd, Khazakh SSR. He spoke German and we talked quite a bit all the way to Moscow, which took 2 days. Later, I corresponded with him for a number of years until his wife wrote back to me one day in 1990 that he had died. I was surprised to find that the undercarriage of the whole train had to be changed at Brest on the Polish-Soviet border, a process that took a couple of hours. 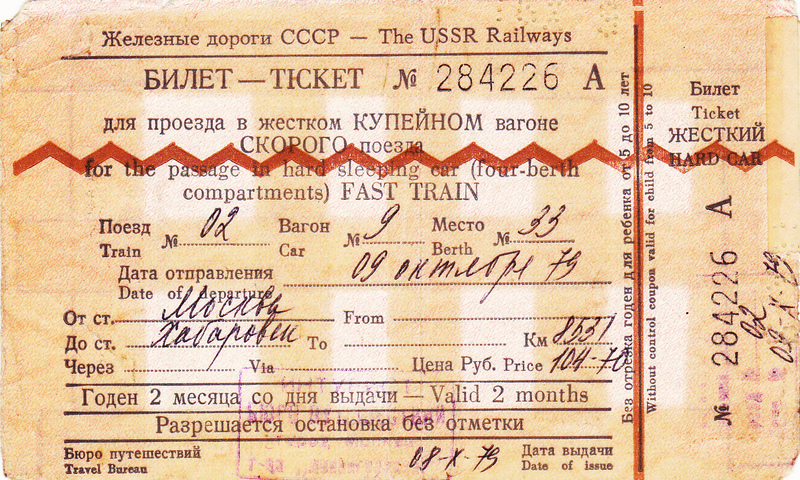 It was, of course, because the rail gauge is different – wider – on the Soviet side. I thought, well, if the Soviets launched a major offensive against western Europe, as us anti-communists feared, they would face a problem bringing enough supplies from the hinterland to their troops on the front line if every train from their country was held up at Brest and other places like that. They would represent bottlenecks. Road and air transport wouldn’t be enough for the logistical job required. Also, those places would make valuable targets for air strikes from the west. I didn’t see how the wheels were changed because a Soviet border guard took me off the train when he found a book (supposedly) of Khrushchev’s memoirs in English in my luggage. I was kept waiting for awhile in an office at the border and was asked to sign a paper agreeing that I could not take that book into the USSR and in effect allowing them to confiscate it. They asked a few questions but were generally polite. I actually had a lot of other stuff in my luggage that I had reason to be more worried about than that book, but they didn’t check very thoroughly at all. In Moscow I once walked into a sort of cafeteria for local workers, listened closely to how the other customers ordered bread, sausage and beer in Russian, and ordered the same in Russian (at the time I still ate meat). I didn’t feel that anybody noticed I was a foreigner. The country looked poor and generally quite shabby to me, not at all like a great superpower. There were other incidents during the trip and especially in Khabarovsk where I did things normally forbidden but nothing happened and I didn’t have the impression that I was being watched very closely. Near Novosibirsk I saw roughly 3 dozen armored personnel carriers on a train in a shunting yard, and when I heard a few months later in Bangkok that the Soviets had just invaded Afghanistan I thought those vehicles I had seen in Siberia might have belonged to a contingent getting ready to move down to Uzbekistan in preparation for the invasion. A few years later, of course, I would come under artillery, mortar, tank and rocket fire from some of those Soviet forces and their Afghan allies in Afghanistan myself – and see a lot of destroyed Soviet APCs, tanks, field guns, etc. – and also many dud bombs lying around (yes, many failed to explode, probably because of the negligence [or even deliberate sabotage] of disgruntled workers in Soviet munitions and other factories, producing mostly shoddy goods). Really, no, to me the Soviet Union didn’t look like a big military power threatening the west, though it took some time for that realization to sink in. Already at the end of 1976 in New York I had read the book La Chute Finale by the French demographer Emmanuel Todd, predicting the collapse of the Soviet Union as a result of worsening economic problems, discrepancies between the Russian heartland and the vassal states, etc. – and I had written a commentary about it (under a pseudonym) that appeared in our paper The News World in early 1977. (I still have a clipping of that commentary, one of the first pieces I wrote that appeared in print).